Little Dragons Cafe, the latest from Harvest Moon‘s creator, is a rip-roaring adventure about raising a dragon and looking after your family’s cafe. With plenty of the elements that we know and love from the classic lifestyle-sim games as well as new innovations on the shopkeeping formula, there’s no shortage of things to do. However, once you’ve gotten table service and ingredient-wrangling down pat, you might be thinking: what else does this game have to offer? Check out our Little Dragons Cafe dragon color guide which will show you how to change your dragon’s color and beef up your cooking repertoire at the same time. It’s important to note that you can have up to 20 different color combinations for your dragon. You can start changing your dragon’s color as soon as you decide on what you want it to be, and it’s not dependent upon you getting past a certain section of the game. Once you unlock the ability to cook and have filled up your cafe menu with a few rudimentary dishes, you’ll be good to go. The first thing you have to remember is that all the dishes that you cook in this game fall under primary colors. Each individual dish will have a Dragon Dye color, and this will become apparent when you view the dish in your inventory. 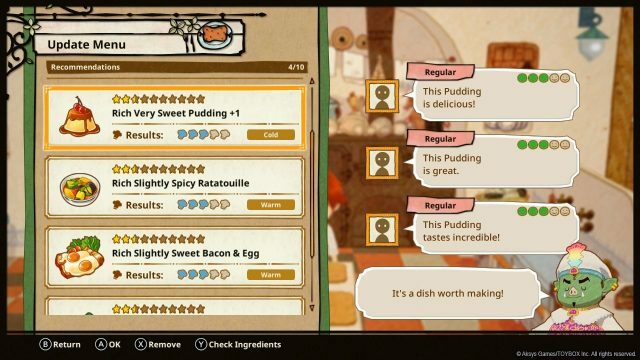 You won’t be able to check the color when you’re in the cooking interface, so it’s best to take a crack at each dish to learn what Dyes they represent. Because of how the game’s Dragon Dye system works, it’s not an instant color change. For example, if you want your dragon to turn out blue, then you will have to feed it blue dishes constantly until its color changes. If you want your dragon to be a variant on a primary color like purple, you will have to feed it both blue and red dishes in order to keep it that special shade. There are so many ways to turn your dragon into the fire-breathing guardian of your dreams, and changing its color is the first step towards that. Your dragon’s original color will either be red, blue, or green, so keep that in mind when you first start preparing dishes to dye it. You should be able to find most of the ingredients that you need in your cafe’s garden, the fish repository by the beach, and by doing some light-hearted exploring with your draconian friend. The world is your multi-colored oyster!